The interest-only product has undergone tremendous evolution, from its mass-market glory days in the run-up to the crisis, to its rebirth as a niche product. However, since reaching a low-point in 2016, the interest-only market is starting to show signs of life again as lenders re-enter the market. 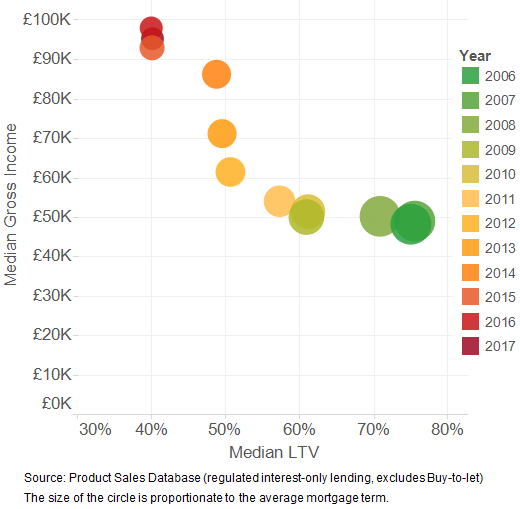 The chart shows how in 2006, interest-only mortgages were used by borrowers in the UK to purchase a higher value property than they otherwise might have been able to afford with a capital or repayment mortgage. This was because monthly repayments were lower for the interest only mortgage, and relatively high Loan-to-value (LTV) ratios meant that a lower deposit was required. The drawback was that borrowers needed enough funds to repay the entire capital outstanding at the end of the mortgage term. Since the crisis, rules have come in requiring lenders to have credible repayment strategies for the capital outstanding, and implement stricter underwriting standards on affordability. 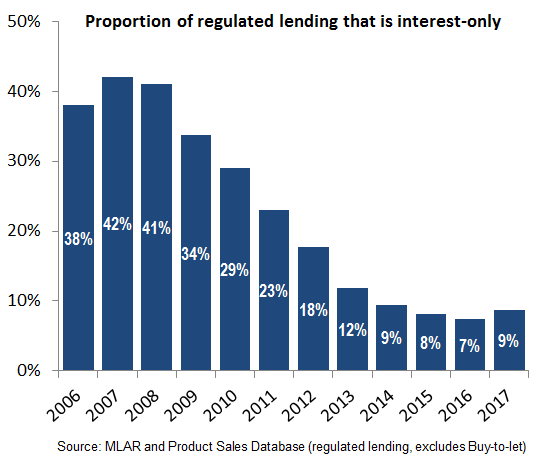 Accordingly, the interest-only product has evolved into a much more niche product (falling from 42% of new lending in 2007 to just 7% of lending in 2016), predominantly targeted at higher-income borrowers. The combination of shorter mortgage terms and low LTVs suggest that borrowers are now using the product as a source of cheap borrowing for other purposes, rather than solely for house purchase. However more recently, there are signs that lenders are starting to expand interest-only lending again, which rose to £5.4bn in Q3 2017, a 45% increase on the previous year. Sachin Galaiya works in the Bank’s Retail Credit Risk Team. Interest only mortgages represent a systemic risk. Aggregate data (the most recent figure being 9% of mainstream regulated lending in 2017) hides the probability that some mortgage lenders have a much higher percentage of interest only mortgage lending in their new business portfolio. A significant number of mortgage lenders also have a substantial portfolio of interest only mortgages written at the height of the mortgage lending boom, prior to the great financial crisis. Risk management policies of mortgage lenders must be carefully scrutinised by financial regulators. Such policies need to take account of the different characteristics of the residential housing market in London, Scotland and Northern Ireland. Experience in the mortgage industry, as a member of a Risk Management Committee (with significant mortgage lending policy influence) clearly indicates that interest only mortgages pose a much higher risk than conventional annuity mortgages, and must therefore be subject to far stricter underwriting criteria. My professional view is that, in respect of mortgages with a loan to value ratio in excess of 50%, interest only mortgages should represent only a small percentage of the total mortgage portfolio (circa <5%). The operating environment in respect of home ownership mortgages has changed significantly in recent years, as a result of both social and economic factors. These factors have, on balance, increased the risk of mortgage default. The principal change has been the impact of house price inflation on ability to buy. This has resulted in an increased number of people (including family and friends) contributing to the initial deposit – and often to the mortgage repayments. This makes the mortgage lender more vulnerable to a wider range of people whose contributions to the mortgage payments are essential. The other key change is reduced job security, which might require a borrower moving house more frequently – not necessarily at a time when there is a profit on sale. There is a legitimate market for interest only mortgages. Mortgage underwriters and financial regulators must be able to rigorously quantify the risk inherent in interest only mortgage business. Capital adequacy prudential requirements should fully reflect the increased risk. Any pressure from powerful financial institutions must be resisted. The relative strength of (1) risk management (2) underwriting criteria and (3) prudential requirements, will have an important bearing on long term financial sector profitability and (via the strength of the financial system) on long term UK economic growth. There must be no return to the softer touch regulation and underwriting criteria of the early years of the 21st century.